Syfy’s got two shows adapted from book series coming to TV soon: The Expanse and Hunters. And they’ve both got their eyes on the human condition. We’ve already talked about the pilot for The Expanse and how great it is—it bears a bit of repeating, because it truly is excellent and different from the books in a way that shows a great understanding on the part of the showrunners—but the New York Comic Con panel gave a little bit more information. Executive producer Hawk Ostby said that what drew them to the universe created by S.A. Corey in the books was the setting, with fellow EP Mark Fergus adding that the division between Earth, Mars, and the Belt gave them questions to delve into. The Belters, he said, are the “new oppressed class, the new working class” who are “asked to build empires for other people but have no stake” in its success. Syfy’s other show, Hunters, is based on the Alien Hunter series by Whitley Strieber. In it, the abduction of an FBI agent’s wife leads him to the ETU—a secret unit which tracks down a terrorist group made up of aliens called Hunters. In both shows there’s a commitment to quality science fiction from Syfy that is refreshing. 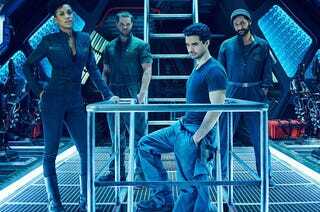 The Expanse premieres December 14 and Hunters April, 2016.